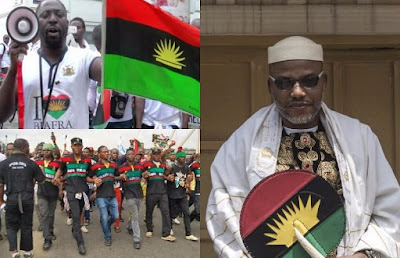 The Indigenous People of Biafra (IPOB) has blamed the Nigerian government and military for withholding points of interest on the whereabouts of its leader, Nnamdi Kanu. The group said it was persuaded that Kanu may have been killed, bemoaning that he has not been seen or heard, days after troops raged his residence. This is contained in an announcement by its representative, Emma Powerful on Monday. It peruses: "IPOB and it's leadership worldwide under the order and leadership of Mazi Nnamdi Kanu wish to convey to the notice of the entire world that the whereabouts of our leader Mazi Nnamdi Kanu and parents are as yet obscure to humanity since the assault in his compound a week ago. "IPOB have been searching for our leader Mazi Nnamdi Kanu and parents not a single where in sight since a week ago, we are testing the Nigerian armed force and police to create our leader Mazi Nnamdi since it is a privilege appropriate for him to influence proclamation to educate his partners and overflowing members everywhere throughout the world about his condition. "For the armed force efficient withdrawal and sending of police and the presenting of police on each key places around his compound and the whole group demonstrates that the Nigerian government knows the whereabouts of our leader Mazi Nnamdi Kanu whether he is alive or dead on the grounds that the armed force have done the employment they were sent to do by picking Nnamdi Kanu, men and ladies of good conscience over the globe to win on Nigerian government and her security operatives particularly the Nigerian armed force with the South East governors to create our leader Mazi Nnamdi Kanu before it is past the point of no return, since we have dove so deep in scan for our leader Mazi Nnamdi Kanu not a single where in sight. "Since a week ago assault and surge against Kanu's compound at Isiama Afaraukwu Ibeku Umuahia Abia State no eye have ever observed Mazi Nnamdi Kanu the IPOB leader. We likewise request that the world disclose to Nigerian government on the off chance that they captured our leader Mazi Nnamdi Kanu and parents or murdered they should tell the world and Biafrans. "Ample opportunity has already past the entire world make inquiries about Nnamdi Kanu' whereabouts in light of the fact that Kanu's family were inside the compound amid the assault. We likewise watched that amid the and overwhelming overbearing on Nnamdi Kanu' family around 22 IPOB members were executed and their dead bodies were taking without end by Nigerian armed force and cops who were drafted for the assault. "We can't learn where IPOB leader Mazi Nnamdi Kanu and parents are from that point forward. We are stressed how Nigerian armed force and cops drafted to do this egregious wrongdoing would do would get our leader Mazi Nnamdi Kanu and parents amid the surge without influencing it to open and they are as yet staying silent and quiet finished the whereabouts of our leader Mazi Nnamdi Kanu and parents up till this time. "We were made to comprehend on the daily paper productions that the request before seeking the assault was to get Nnamdi Kanu alive or dead, we inquire as to whether they have killed him with his parents they should let the entire world think about it and quit staying silent over the life of IPOB leader Mazi Nnamdi Kanu. "It is troubling for the Nigerian armed force and police to came to release assault on our leader Mazi Nnamdi Kanu who has been on safeguard without getting consent from the government high court that has been dealing with the case in Abuja. "The court conceded Mazi Nnamdi Kanu abandon 25th April 2017 from that point forward Nnamdi Kanu has never gone out Nigeria or cover up for any reason rather he was caught up with arranging his kin for up and coming referendum and court case in Abuja on seventeenth April 2017 which must hold for Biafra freedom regardless of what the Nigerian government and her security operatives and couple of politicians do to intimidate our kin. "We as a whole know that our leader Mazi Nnamdi Kanu is a brave person and decide to reestablish Biafra and he has just guaranteed the Nigerian government amid the peaceful rallies at Ekwulobia and Aba that he will be in court on seventeenth October 2017 with more than two million members of IPOB and Biafrans on that seventeenth day of October 2017 for the becoming aware of the case amongst IPOB and Nigerian government. "As it is today, we watched that the Hausa fulani ruled security operatives have satisfying their threats by taking our leader Mazi Nnamdi Kanu down to kaduna or kano jail where no one can hear or know anything from him, in the event that he still alive."